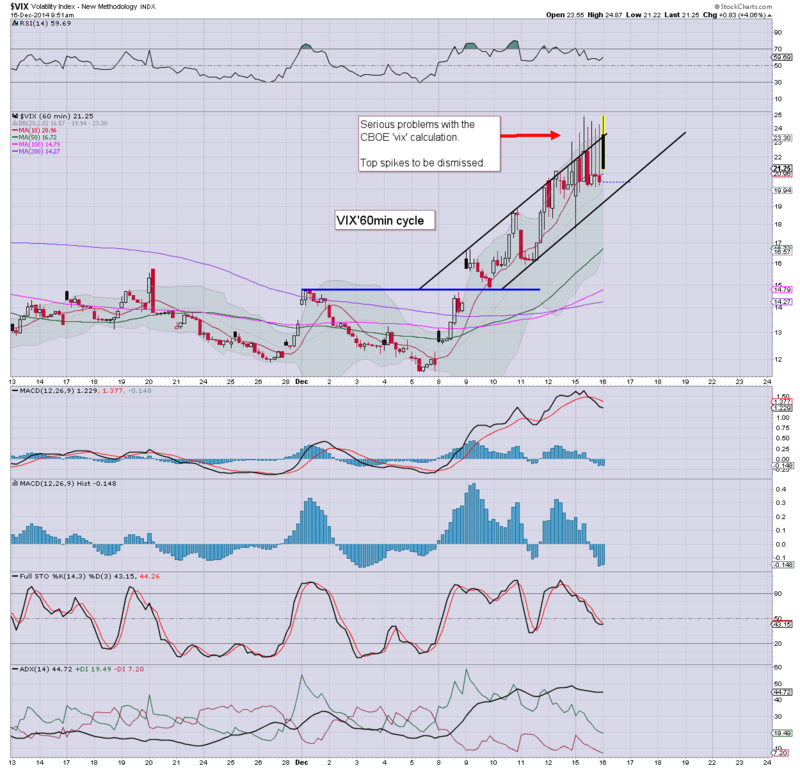 With equities seeing some very significant swings across the day, the VIX managed significant gains, settling +15.4% @ 23.57. 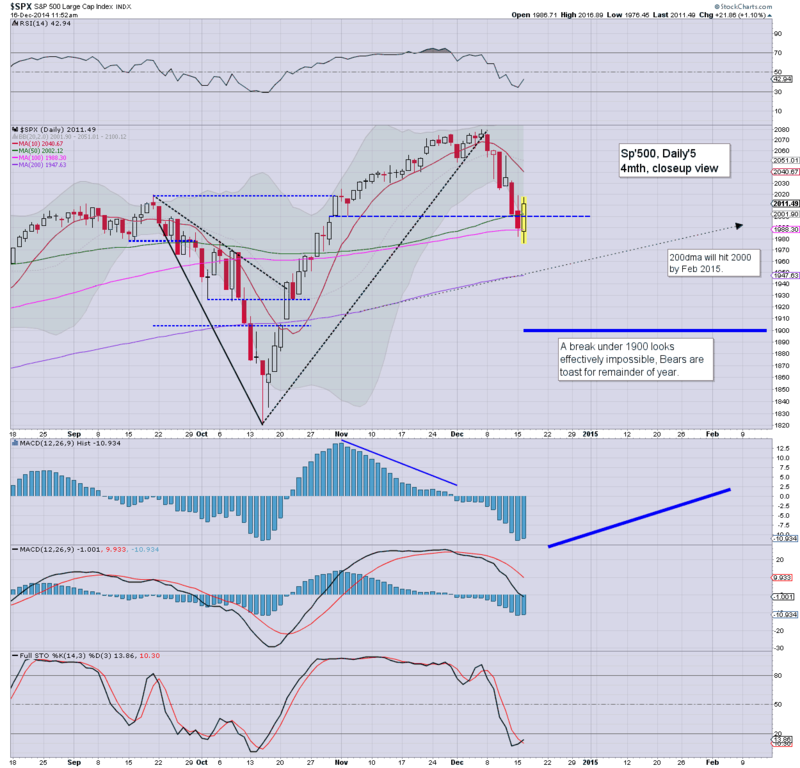 Near term outlook is for a key equity turn (most bearish case, sp'1950).. before VIX cools lower into year end. *on a technical note, it appears the CBOE have reverted to an older software model, and the VIX spikes have ceased this afternoon. Equities look set for a key turn around the next FOMC tomorrow, and if that is the case, then VIX should start to rapidly cool into year end. By mid/late January.. if new index highs (>sp'2079).. then VIX will be in the low teens. US equities saw further significant volatility, swinging from an opening low of sp'1976 to 2016, and settling -16pts @ 1972. The two leaders - Trans/R2K, settled -1.3% and -0.1% respectively. 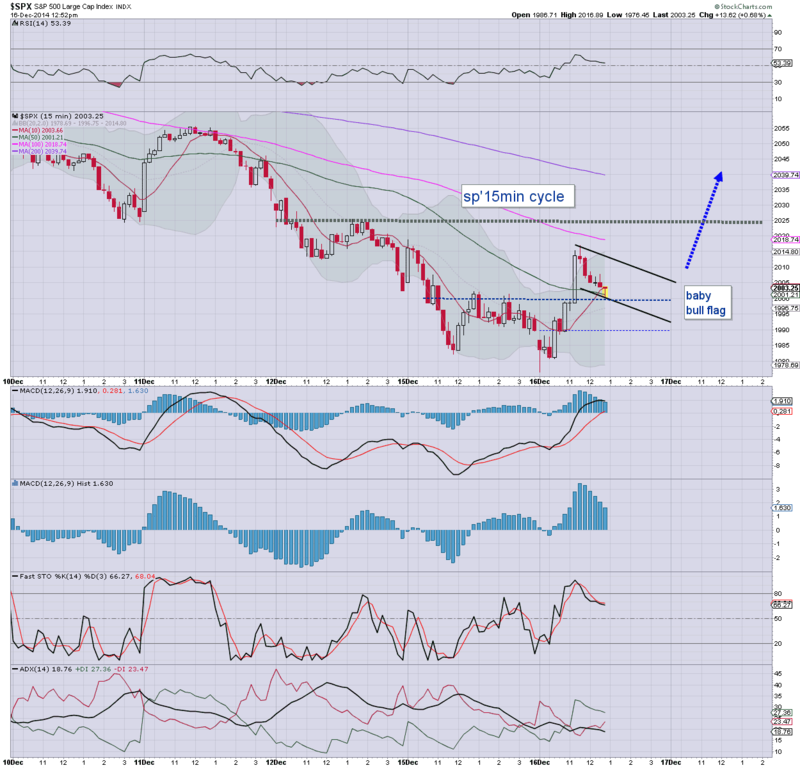 Near term outlook is for a key floor/turn at the next FOMC. *closing hour action was very much weaker than I expected... regardless... the Yellen will appear tomorrow. Yet another really interesting day.. with some dynamic swings. 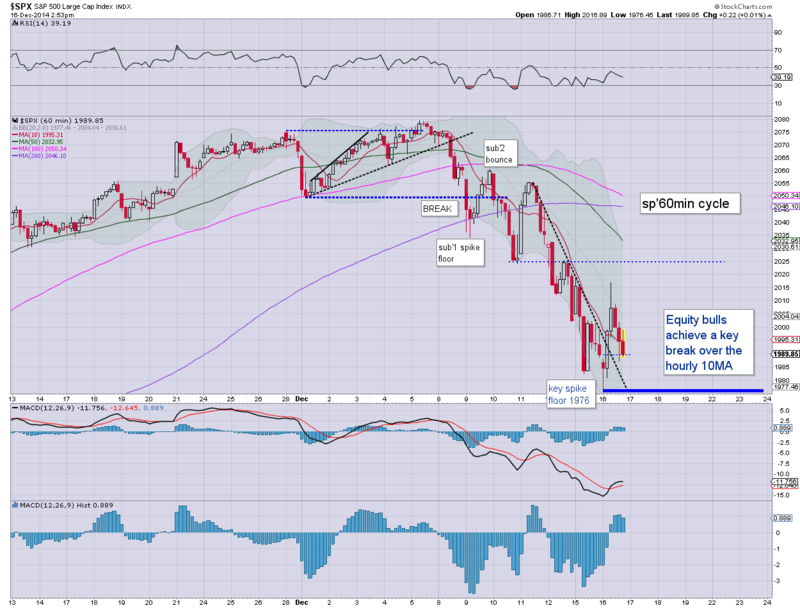 A 2% ramp from the opening low, then some very significant weakness (-2.2% from midday) into the close. Tomorrow will be the last big trading day of the year, and should mark a 'safe place' for the bull maniacs to be long... into early 2015. 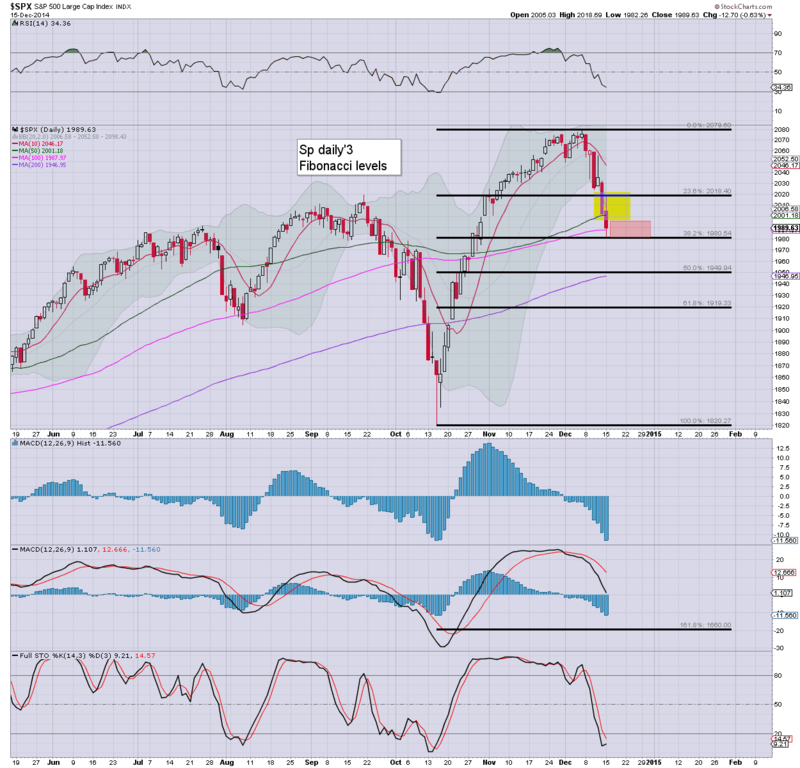 US equities remain very choppy, with the market set for a daily close in the sp'1985/2000 zone. 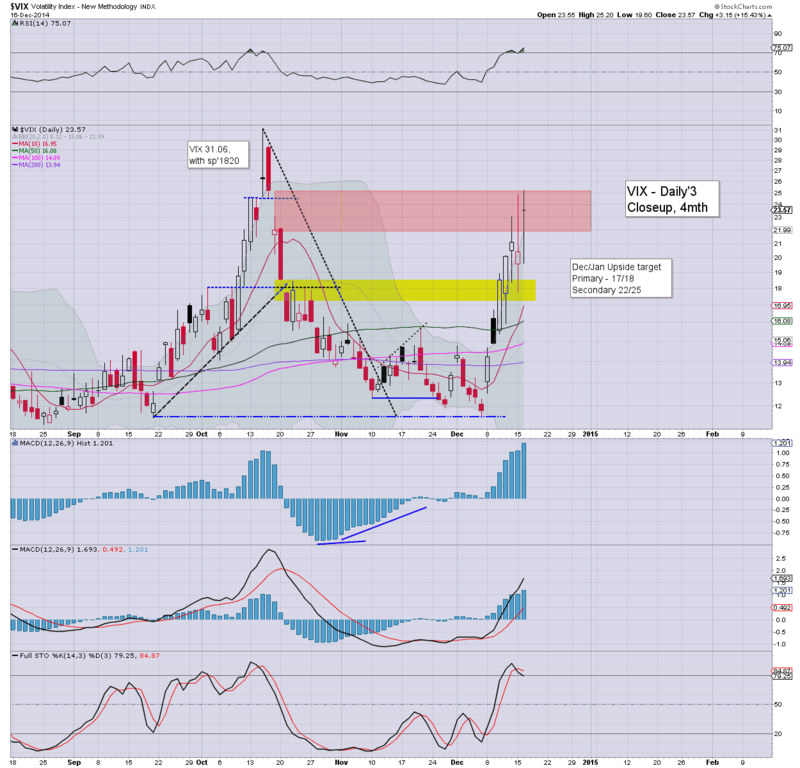 VIX remains relatively quiet, +6% in the upper 21s. Metals are weak, Gold +$4, whilst Silver is -2.4%. Oil remains very unstable, +0.9%.. some 2% below the earlier high. Well, its been one hell of a day... and tomorrow looks likely to be almost as exciting.. with the FOMC. 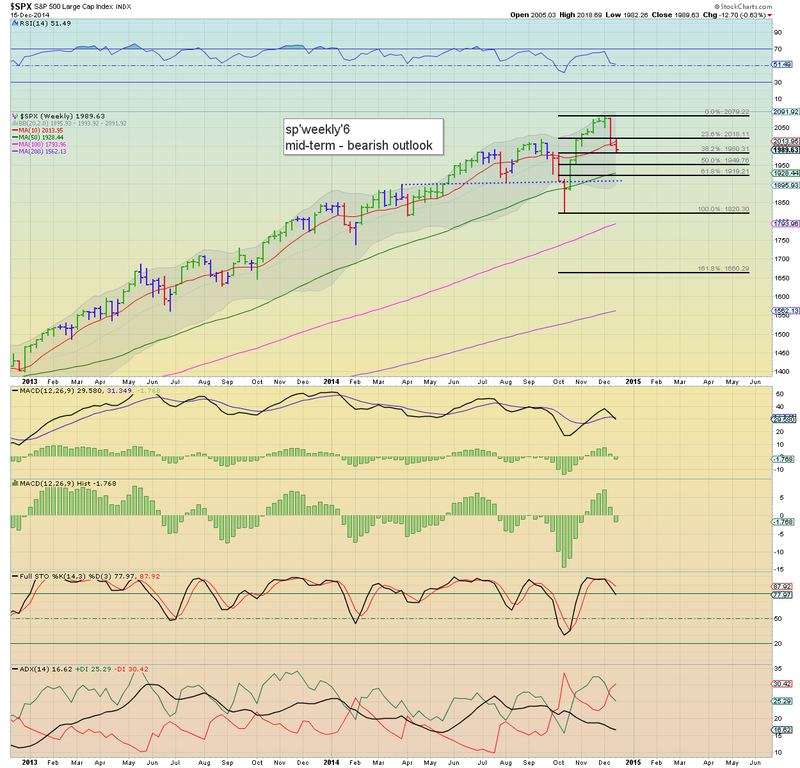 What should be absolutely clear... once the Fed is out of the way.. the market has a clear run into January. Well.. no one can call this market boring! We've seen a stronger than expected down wave of around -1.2%.. even briefly under 1990. Regardless of the close... the Yellen is on her way. Notable weakness: airlines.. DAL -3.5%... UAL -2.0%... no doubt due to oil gains. US equities have cooled a little from the earlier high of sp'2016. Price structure is offering a baby bull flag, with renewed upside after the typical turn time of 2.30pm. Metals are battling to hold minor gains, Gold +$7, but vulnerable to closing red. Choppy action into the early afternoon. Seeking market to level out in the 2000/1995 zone by 2.30pm.. and then up into the close. Strength: oil/gas drillers, SDRL/RIG +5% or so. 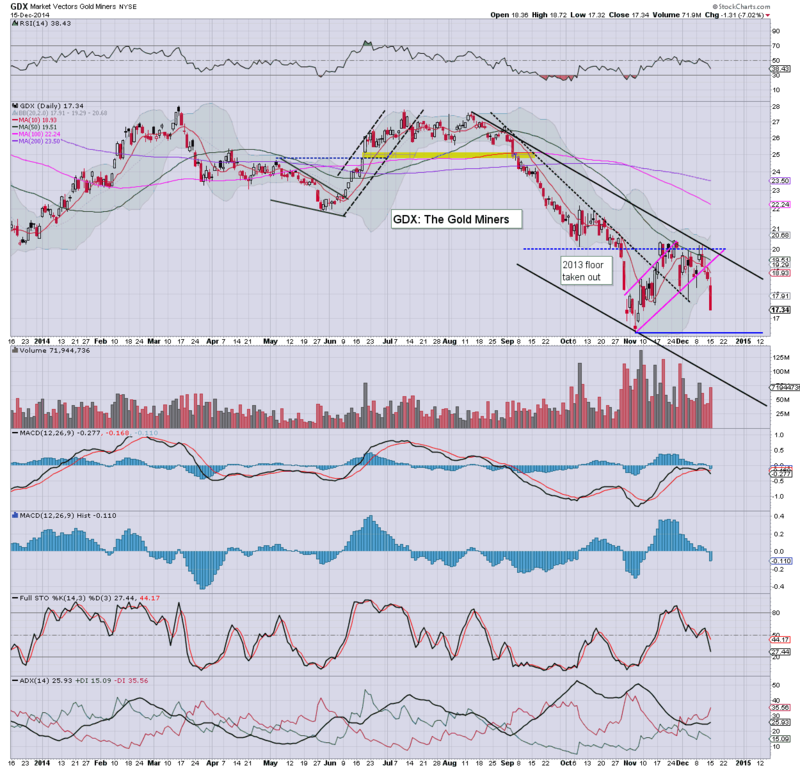 If oil is set for a major multi-month bounce..to the low $70s.. then drillers are going to soar into early spring. 1.16pm.. Hmm... the latest micro down wave is a little more strong than expected. Regardless... the Yellen is coming tomorrow afternoon.... bears beware. 1.35pm... sure is one hell of a volatile market. As ever.. for the big money... trading stops are a must. Notable weakness, Alcoa (AA) -2.1%.. although I'm broadly bullish on that one... for next yr.
Another very dynamic day in market land. No doubt, many bears who are still holding short, are getting real annoyed about. With the FOMC announcement. Action in the metals is interesting, Gold - already having turned red... should see renewed weakness into the close... but more so.. post-Yellen. The opening reversal is holding, with the sp' already having climbed to 1994. A break over the hourly 10MA will be significant, and offer a pre-FOMC floor of 1976. Metals have lost ALL of the early gains, Gold -$2.. taking the miners with them (GDX swinging from +4.5% to -0.9%). *another interesting day in market land.. with just 12 trading days left of the year... hey... at least its not boring! So.. reversal candles all over the place... and with the FOMC meeting now underway.. with a policy announcement tomorrow at 2pm.... the equity bears arguably should have bailed. 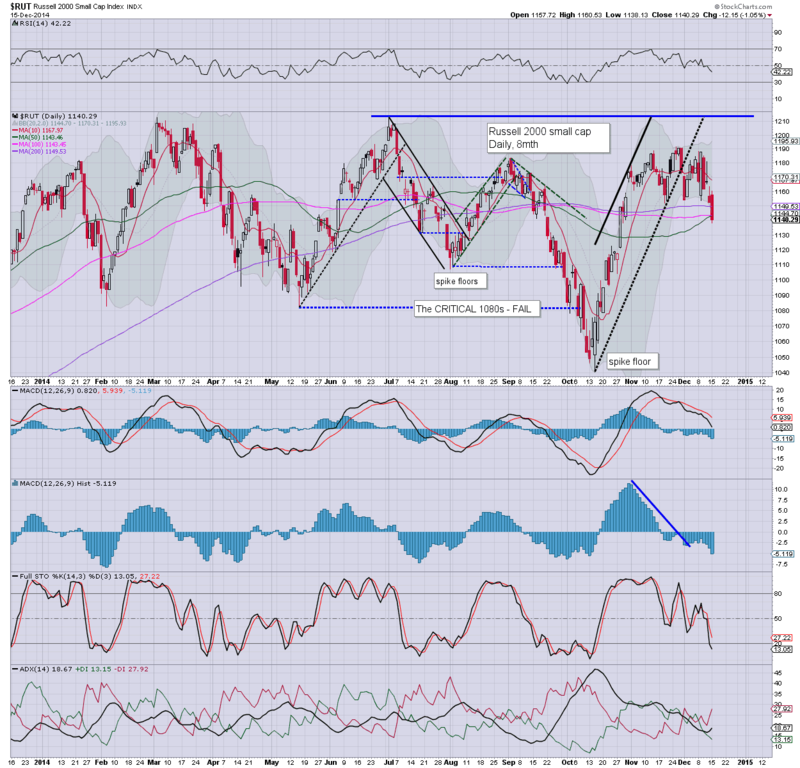 Russia: -13% @ 624... secondary 'core support' is around 550.. around 12% to go. *Key break above hourly 10MA... achieved... bears are on the run.... big stops being hit. US equities open moderately lower, with a new cycle low of sp'1976. 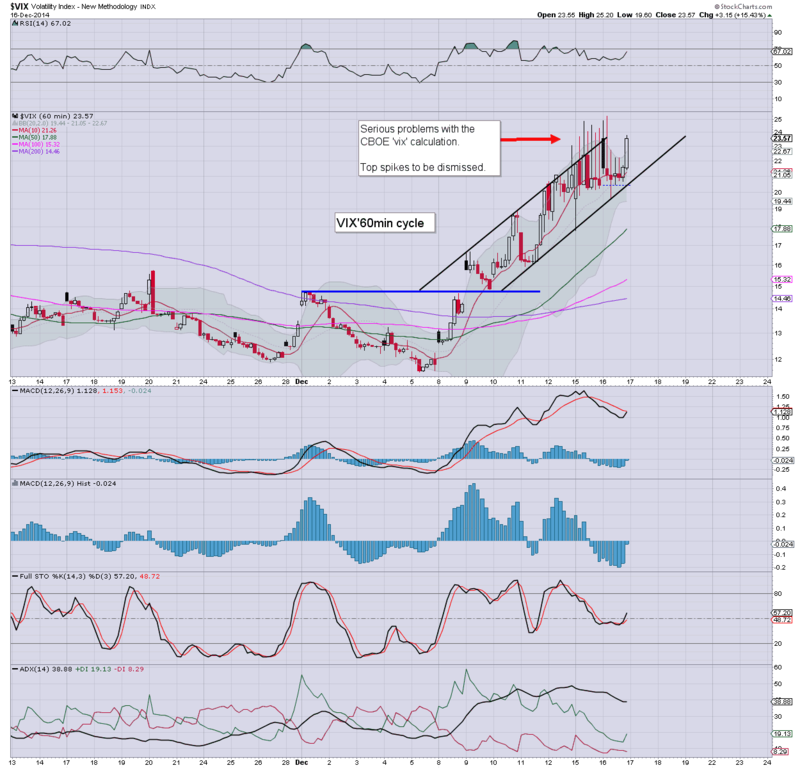 VIX remains literally 'broken', with bizarre momentary spikes to the upper 24s.. 'Real VIX' is somewhere in the 21s. Metals are strongly higher, Gold +$18, whilst energy prices are weak, Nat' gas and Oil, both lower by around -1.6%. So.. we're lower, but there is going to be persistant threat of a reversal.. and renewed upside from here. The FOMC clock is ticking... Yellen is on her way... bears... beware! There can be NO excuses later this week. Notable gains, GDX +2.6%.. reacting to the initial gains in metals. 10.01am.. Metals are cooling, Gold has slipped from +$24 in pre-market to +$12.... GDX is already close to turning red. 10.18am... R2K... Dow... turning positive. 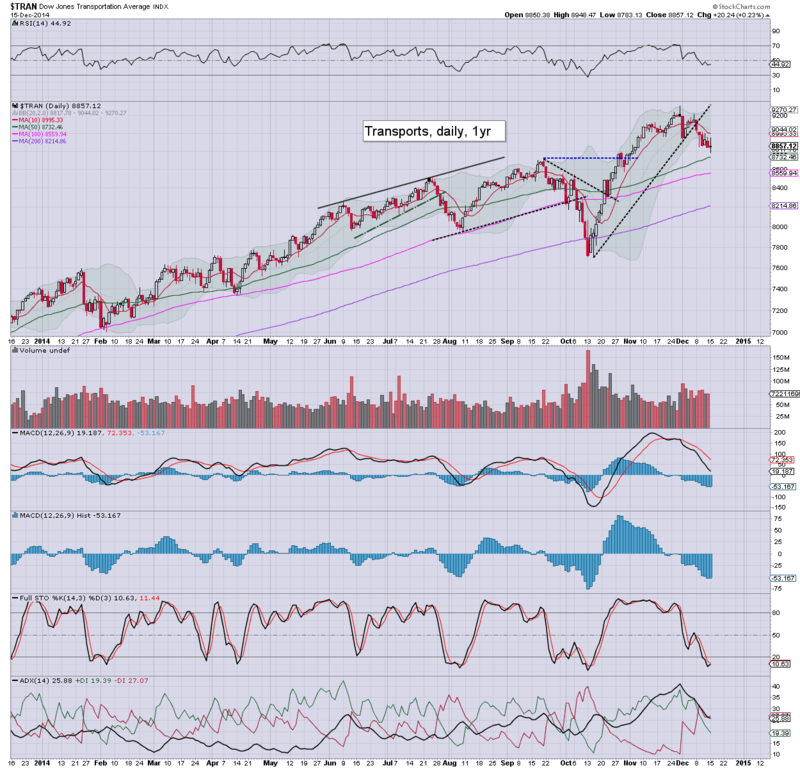 First target.. sp'1995... but that target is to be reduced each hour. 10.46am.. minor chop... and the reversal.. so far is holding. Metals set to turn red... and take the miners with them... and it ain't even Fed day yet. Good morning. Futures are moderately lower, sp -12pts, we're set to open at a new cycle low of 1977. With a very weak USD, -0.9%, the metals are strongly higher, Gold +$24. Oil remains in collapse mode, -2.0%... having reached the $53s. 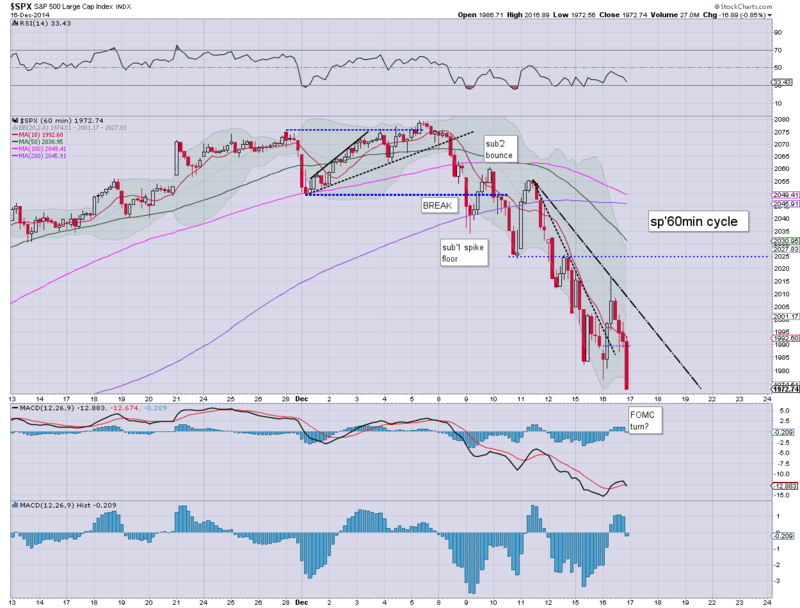 Having broken yesterday's low.. the next level is clearly the 200dma, along with the 50% fib retrace around 1950. That is of course a full 2% below yesterday's close. Considering the current mood in early market... it now looks like we'll get there. 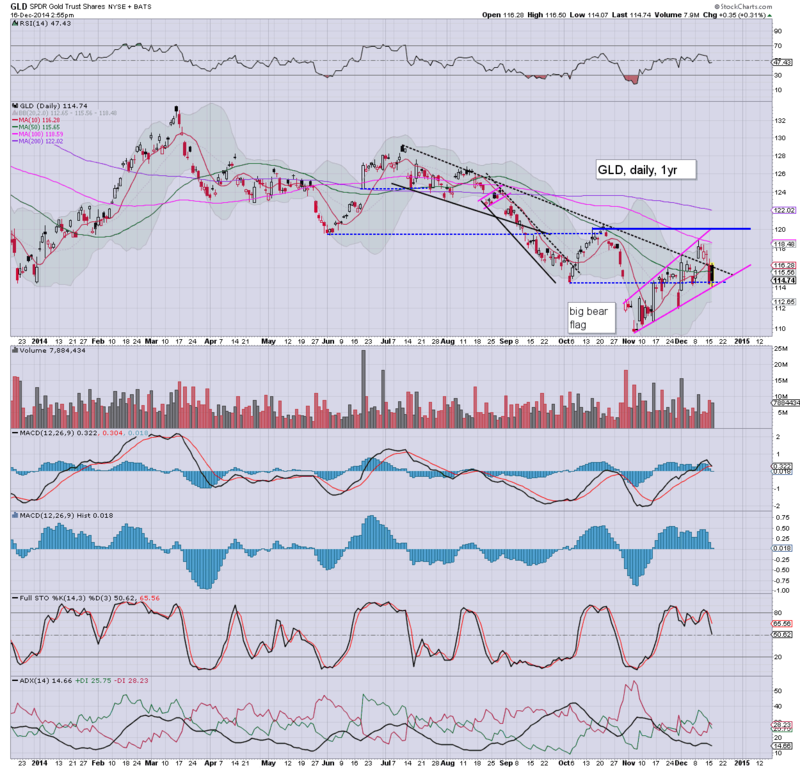 Notable early strength: GDX +4.4%... naturally.. a result of the strong metal gains. Will be interesting to see how they are trading after the FOMC meeting. Regardless of today, the window for the bears IS still due to close. If we do reach 1950 by tomorrow... I will indeed be surprised, but we'll still be due to rally from there. Incredible.. the Russian market was trading at 578 earlier.. that was almost a fall of -20% fall. We've almost tested secondary support of 550s. 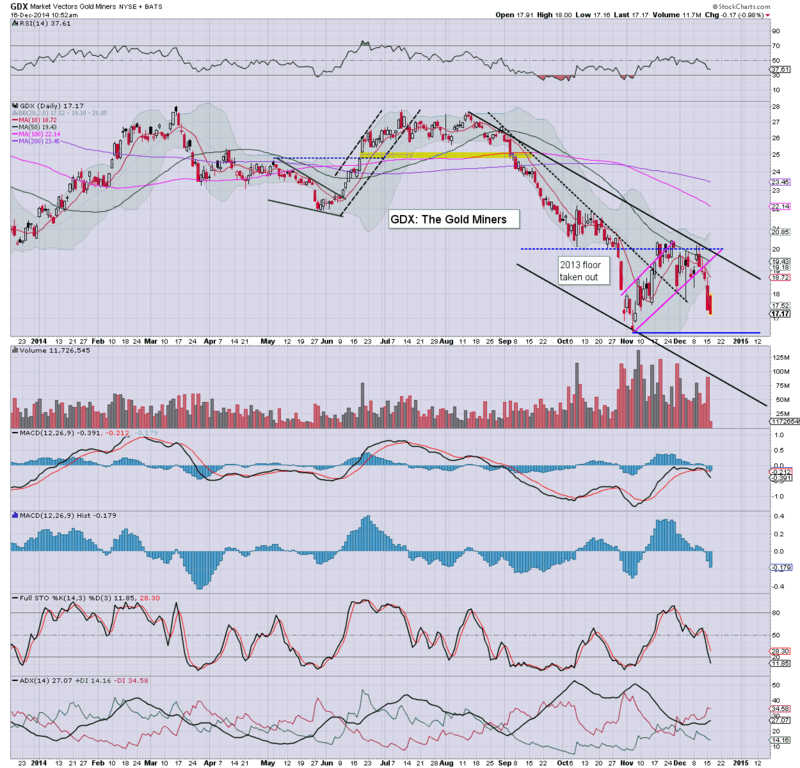 Meanwhile.... Russia -13% @ 625.... 75pts (12%) until next target. It was a pretty interesting day in market land, with a major morning fail for the bull maniacs.. the sp'500 swinging from 2018 to 1982 by midday. Yet... with the FOMC announcement this Wednesday (2pm), the window for the equity bears is soon to close. 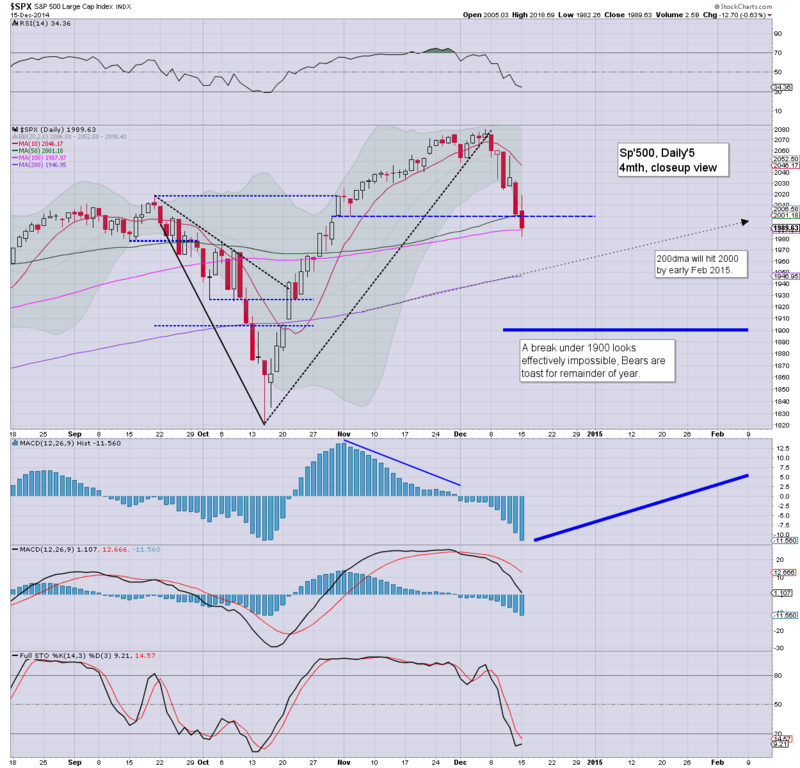 So.. the second consecutive red candle on the weekly 'rainbow' chart.. with a new cycle low of sp'1982. Overall though, once we get the fed out of the way, I'll be looking for renewed upside into the quad-opex weekly close, and all the way into January. With oil prices continuing to fall, the Russian market lost another -9.4% today... now at 725. Next support is not until 550... that is another 175pts (25%) lower! *as for the interest rate rise from 10.5% to 17%... I think I'll leave others to comment on that huge issue.. at least for today. Tuesday will see housing starts and PMI manu' data. 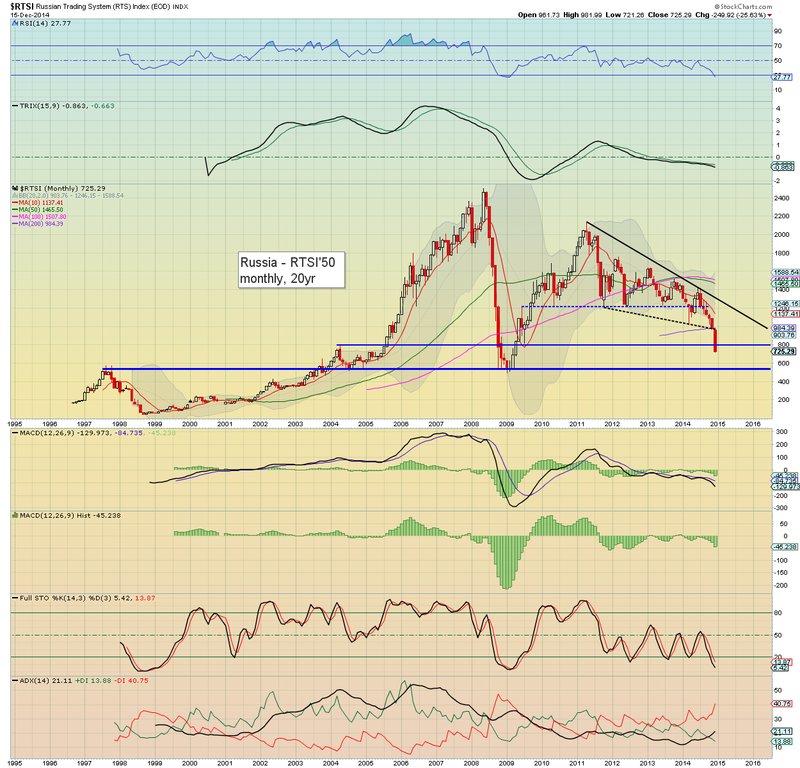 I remain seeking broad weakness for the precious metals (Gold $1100/1080 is just about viable by year end)... and that should naturally result in continued weakness in the mining stocks. Early next year I'll be looking to pick up a number of key long term positions... but more on that.. as we get closer to year end. US equities opened higher (intra high sp'2018), but saw a strong morning swing lower, with a new cycle low of sp'1982, and settling -12pts @ 1989. The two leaders - Trans/R2K, settled +0.2% and -1.0% respectively. Near term outlook is for a key turn around this Wednesday's FOMC. 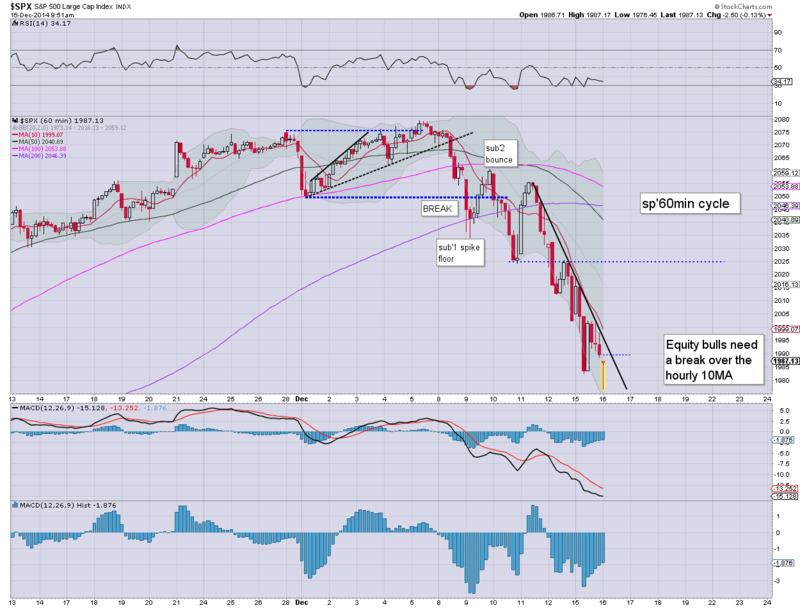 So.. the big sp'2000 threshold failed to hold, along with a daily close decisively under the 50dma. Understandably, many equity bears will be looking for a hit of the 200dma (near the 50% fib retrace of 2050) in the coming days. As has been noted since last week, the 'FOMC clock is ticking'. On no outlook can I see sustained equity downside after this Wednesday's FOMC announcement. It is notable that the 'old leader' did manage a net daily gain today, although that was no doubt aided by the continuing collapse in oil prices.